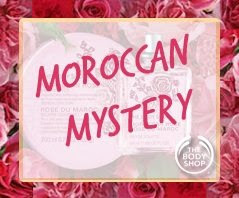 Each day, one of 14 different blogs will be hosting a clue to a different product on The Body Shop website. And today, that blog is none other than The Beauty of Life! Follow the clue to the appropriate product, and then post the product name in the ContestMachine box at the bottom of this post. Winners will then be selected from those readers that correctly post the name of the product. "With notes of spice, mimosa, and vanilla, by any other name, this musky scent would still smell as sweet." Need a hint? Check out The Body Shop's website for help. Entering is easy. Simply enter your name, email address and your answer to the clue in the box below. Entries are being accepted only until midnight tonight. So get crackin'! This giveaway is open to US residents only. Giveaway runs until Wednesday, February 4 at midnight. One entry per person, email address and IP address. Multiple entries will be disqualified. I sure would love to win this nice prize. Thanks for the opportunity!! Mmmmm I love Bath and Body works! My fave is Coconut Lime Verbana, but I have been wanting to try the Morrocan Rose! !